Artist Jennifer Davis, well known for her multi-color animal paintings, painted 2 symmetrical horses, face to face on the front of her bag. 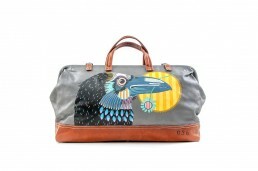 On the back of her bag, she painted a side profile of a crow. 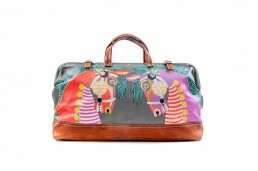 This bag shows her love for animals and nature and the brightly colored lense in which she views her friends, Bag 036.